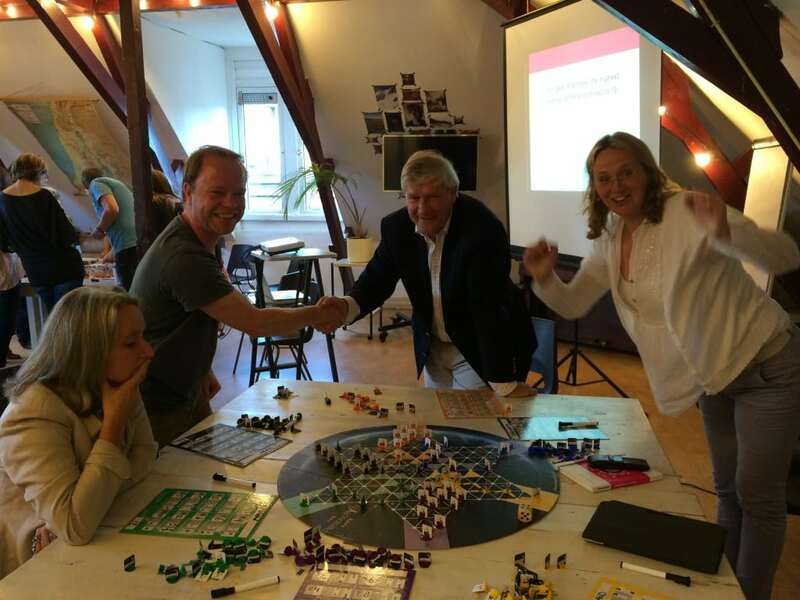 Monday June 30 we hosted an open game session in Utrecht. Although the group was relatively small -only 13 players- it was extremely divers. Together we represented seven nationalities: American, Aruban, Bulgarian, Dutch, Lithuanian, Romanian and even a participant from down under: New Zealand. Backgrounds included sustainability, healthcare, business development, communications, game design and more, and the ages ranged from 20 till 60. We build roads and factories and grew our countries. Wether it was the enormous diversity or not, at one table there was conflict and crises and harsh negotiations. Some were very successful in managing their country. Others lost, over and over again. At the other table participants were commonly seeking for relations between action & results. During the reflection led by Erik Bronsvoort, we shared insights and discussed our own game behavior and translated it to every day life. Comparisons between the difference in behavior at each table increased the learning experience. Food for thought for our own decision making in real life.